The easiest way to add some tropical style to your summer decor is with big beautiful flowers and botanicals. 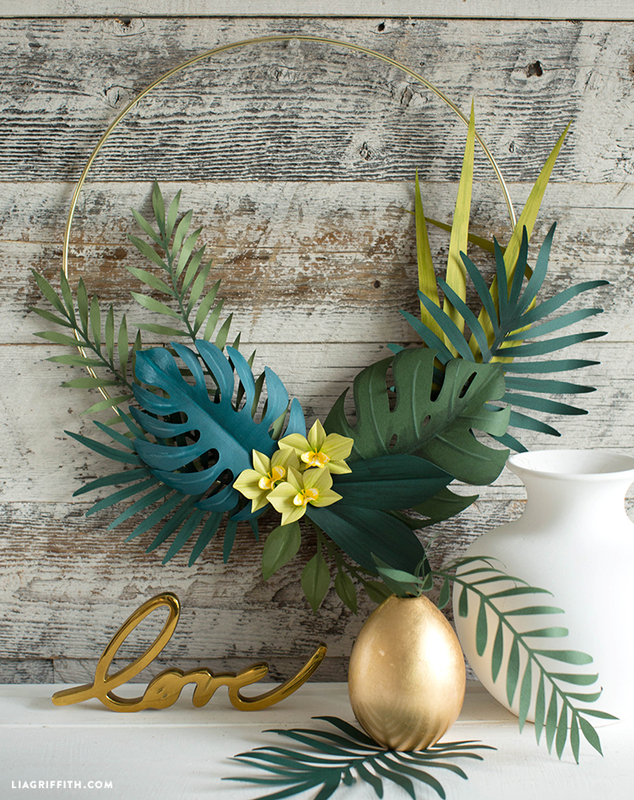 Here is a simple tutorial to make a gorgeous DIY tropical wreath complete with palm leaves, monstera and orchid blooms. Once you trim and color all your botanical pieces, you can arrange them in any way that is a reflection of your unique creativity. Get your favorite little ones in on the project for a fun afternoon activity! Follow the instructions below for crafting the orchid blooms for your wreath, then continue reading for tips on assembling the wreath and styling the leaves! Cut the orchid pieces according to the pattern using a cutting machine, scissors or craft knife. For the center piece of the orchid, dab on color with a yellow marker along the edges and center for a spotty look. Lightly draw lines going outward from the middle of the petals with green marker. Add more color in the centers and blend out with a colorless blender. Curl the sides of the yellow orchid piece inward and the bottom lip edges under. Fold each of the orchid petals in half and curl the edges from the middle. A Cricut scraper is great for curling paper, but you can also use the edge of a pair of scissors. Glue the bottom edge of the sides of the yellow center piece to the bottom lip to form a cone shape. Glue the orchid together in the center with the 2-petal piece on top of the 3-petal. Glue the yellow center on top. 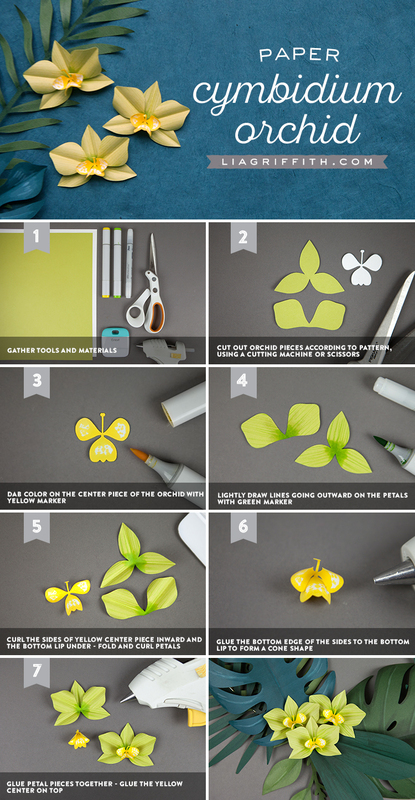 After you make the orchids, you can begin assembling your DIY tropical wreath. 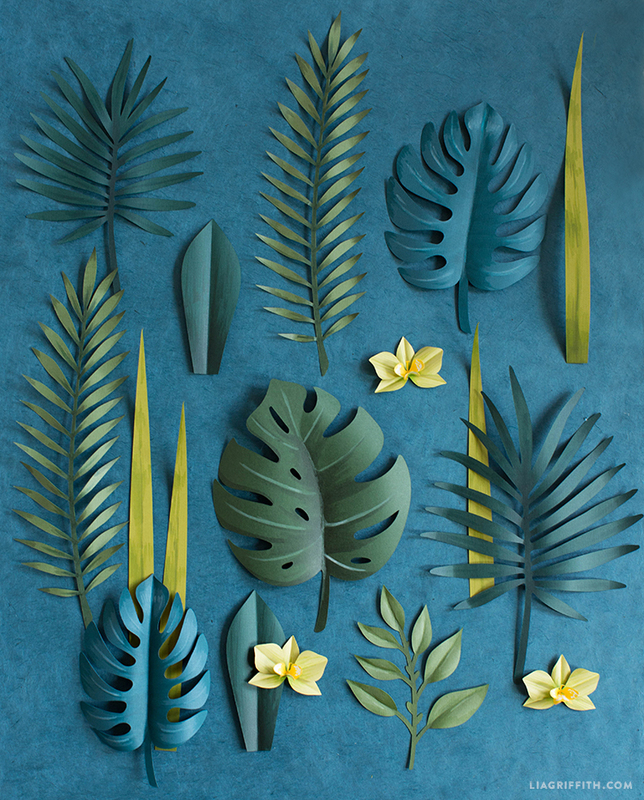 Cut leaves onto multiple shades of green cardstock for variety. Add color detailing and shading to the leaves with art markers. Curl your leaves with the edge of your scissors to add movement and dimension. 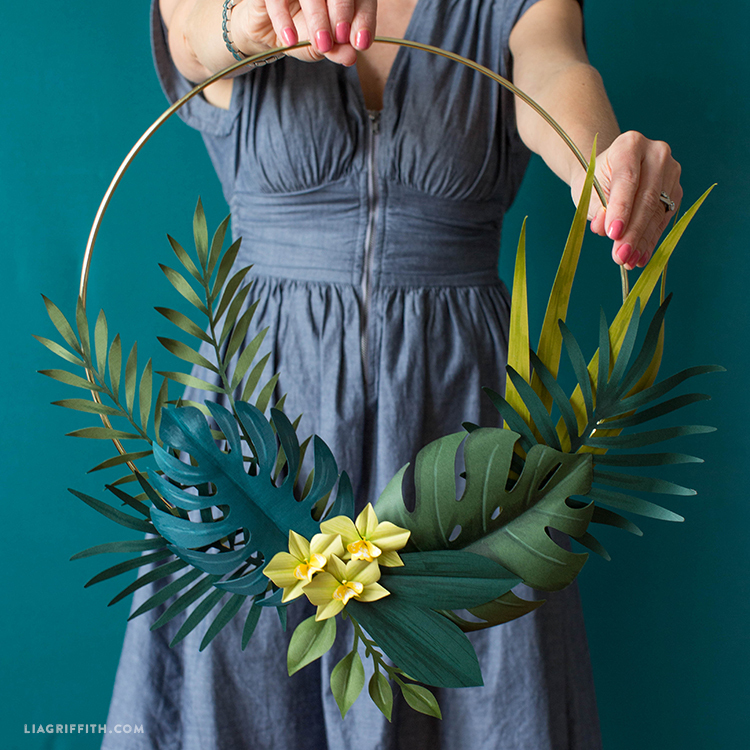 Arrange your finished leaves around your hoop and secure with hot glue. To make the leaves look more realistic with added visual interest, we recommend looking up photos of tropical leaves as a guide. 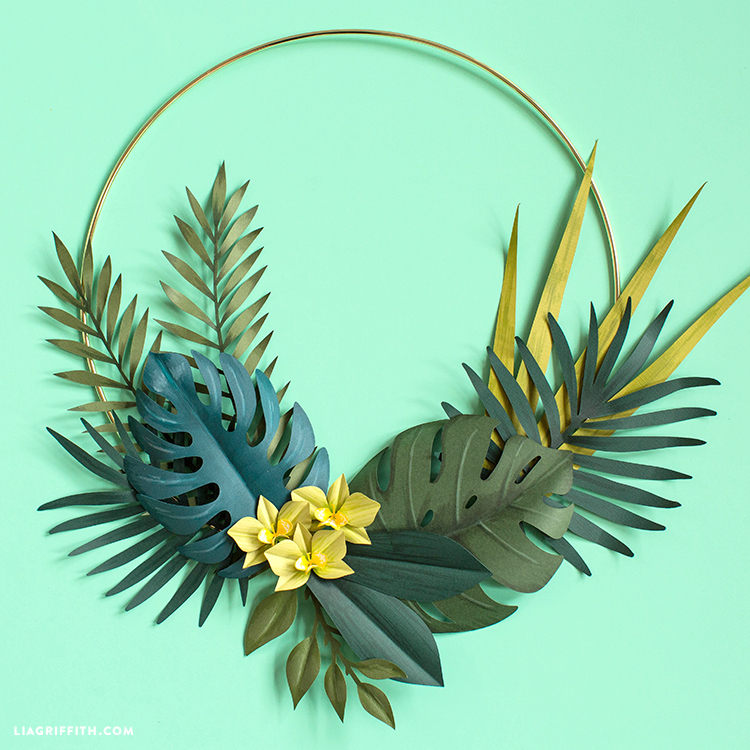 Shade your paper leaves according to the photos – that’s exactly what our maker Krista did for this paper tropical wreath! Along the centers and tips of the leaves, use a color that is darker than the paper you are using. Then, use a white blender marker for highlights on the bigger leaves. They are a bit shiny in real life, so the white will give it that slightly waxy look. 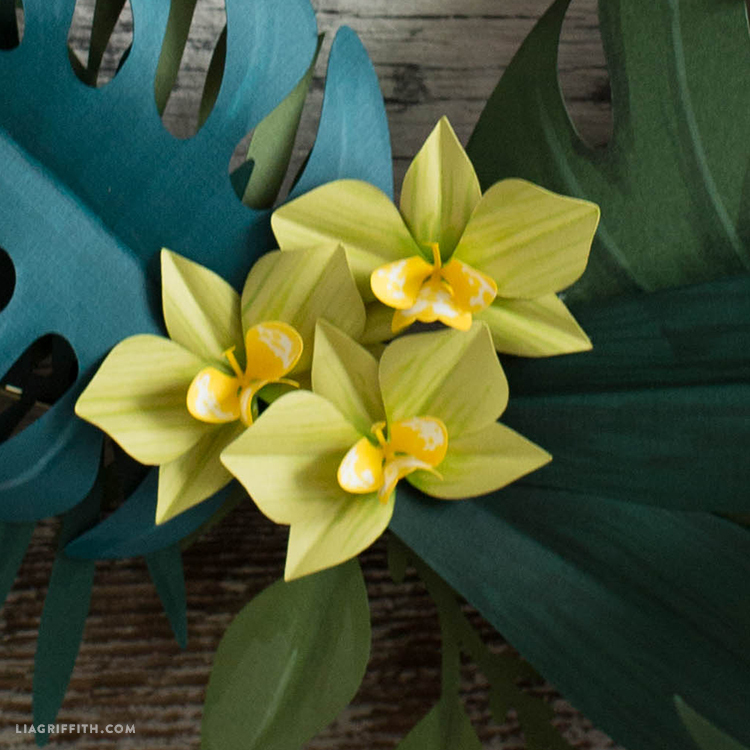 When you’re ready to assemble your DIY tropical wreath, pick one focal point where you will cluster your orchids, then build the leaves out from there. I have your book and it tells me to put in the code to download designs and I can’t seem to do that without buying a membership! We cut these all on 12×12 cardstock (you can downsize the SVG if any are popping in larger than that). In other projects we have used large format art paper (Canson brand) and cut to 12×24. Cricut also sells 12×24 cardstock to fit their mats! MAGNIFIQUE !!! UN VRAI PLAISIR POUR LES YEUX ! It’s really beautiful, a real pleasure to watch. I am impressed. Please don’t stop ! Could you please tell me what color papers you used for the leaves? Also, just confirming – you used cardstock for the leaves and not text weight? I purchased a Cricut two weeks ago and have completely fallen into the rabbit hole of paper crafting. Your website has provided so much inspiration and fun for me over the past few weeks! I’m planning a baby shower for my sister-in-law and now have so many wonderful ideas thanks to the fern and palm projects, especially. Thank you so much! Hi Megan! We used various shades of green 12×12 cardstock that we had on hand, purchased at Michaels awhile back. Unfortunately I didn’t keep track of the exact colors this time, and I don’t see them online so the colors may have been discontinued. I chose cardstock to give the leaves more structure, but these could also be made with text weight! Fantastic, thank you so much for responding! So when using the svg cut patterns with my cricut , how do I get the score lines to score on the petals? my cricut loads it as a 3rd page and when putting the cut page back in as the 3rd page the score lines do not line up. Help. When you upload the SVG file, you need to change each line that you want scored from the CUT (scissors) to the SCORE. Then you’ll need to UNGROUP the files in the layers panel, and individually select and ATTACH each leaf to its coordinating score line. You may want to spend some time on Cricut’s site or YouTube channel for tutorials of this and other Cricut basics: https://help.cricut.com/help/cut-write-score-print-with-explore, https://www.youtube.com/watch?v=upNi7Ep_6iU&list=PLmMKNg1O7D-e4sPih-kdFolhMOO__sA0N&index=4. Have fun! Hi! Beautiful project. I’d love to know what brand of art markers you used for this? Thank you! Please, need your assistance. For some time now have not been able to print out any of how-to’s for projects except ones by patterns. I really like/need to print out pictorial instructions along with how-to’s at beginning of project descriptions. Used to be able to print all with no problem, did something change along the way? Desperately need a specific email sent to me explaining how I can access printing any and all how-to’s. Is this possible? If an answer is supplied as a reply to my comment am not able to find your post again. An answer might have been made in past when I asked about this but if so, couldn’t find reply. I apologize ahead of time for needing extra help but assure you extra effort will be so appreciated. Still love each and every incredible project.